New technology allows us to produce your design more rapidly, and often more cheaply, than the traditional hand crafted approach. CAD, or Computer Aided Design, has revolutionised the service I can offer. This design technique takes your ideas or sketches and converts them to a computer produced picture which can be altered many times until the design matches your ideal. that may be too expensive or time consuming to make by hand. Following production of a CAD image, the item is made by computer through a casting technique. This means that there is less wastage and so the price is normally lower than a hand made piece. Pretty much anything else that you can imagine! 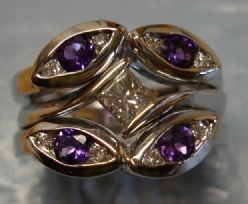 A tricky shape engagement ring made for a tricky shaped wedding ring. The husband to be was an engineer so he came up with a different design. 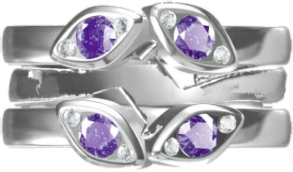 9ct white gold, channel set with 3mm Amethysts and small diamonds make this wedding ring truly spectacular. 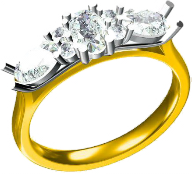 The wedding ring needed to surround the engagement ring with the facility for the engagement ring to be removed at any time. The latest technology in jewellery design and manufacture is Computer Aided Design (CAD). This technique allows you to change the design at no extra cost and can be much cheaper than Handmade and just as versatile. For those tricky awkward to make designs where wastage is an issue CAD is a must. The design is put together on the computer and a drawing is made. This design can be seen from various angles so that you can imagine how it will look in real life. Alterations can then be made on the drawing, sizes, shape, where the stones go etc. etc. Once the design is agreed the ring or object can then be manufactured by casting therefore eliminating waste. This brings down the price, it is also much quicker than handmade. 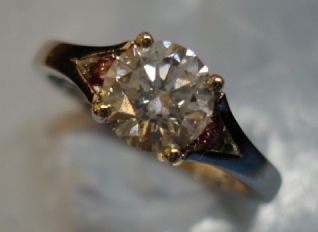 Computer-Aided Designs (CAD) were done to match the design of an original ring worn by one of the Bishop’s ancestors. 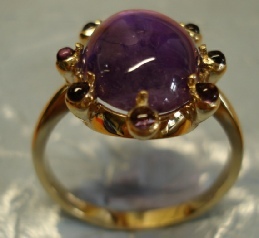 The original picture showed a blue stone but traditionally the Bishop’s Ring has an Amethyst stone. Once the CAD images were done and shown to the Bishop the ring was then cast, set and finished by hand to the final product as pictured here on the left .